Prominent & Leading Service Provider from New Delhi, we offer predictive maintenance service provider. Maintenance technique that is helping the maintenance engineers these days is Predictive and Proactive maintenance. Predictive maintenance has several benefits over breakdown and preventive maintenance, as down time and spare inventory reduces. As the name suggests, to predict the fault well before it occurs is predictive maintenance. 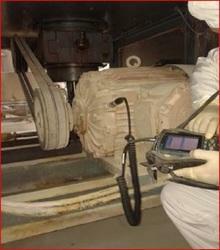 This technique incorporates several methods of testing as vibration analysis, ultrasound analysis, thermography analysis, oil analysis, motor current signature analysis etc. By adopting all these techniques we can monitor and trend the condition of machine and place alarm whenever we see any abnormality in trend. Looking for Turbine Testing Services ?